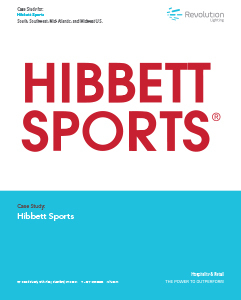 Hibbett Sports - Revolution Lighting Technologies, Inc.
Hibbett Sports chooses Revolution Lighting to replace existing fluorescent lighting throughout 300 retail stores to improve energy efficiency and light output. Energy efficiency for retrofit lighting improves 67%. Payback for the lighting retrofit less than 2 years.